The story below is directly copied from Sandy's email. As you can tell, her sister is using Chemo caps and since I had the need to use them in 2008 this really hits home for me. I agree withn absolutely everything that her sister has said, so go ahead and make these for anyone you think might benefit. 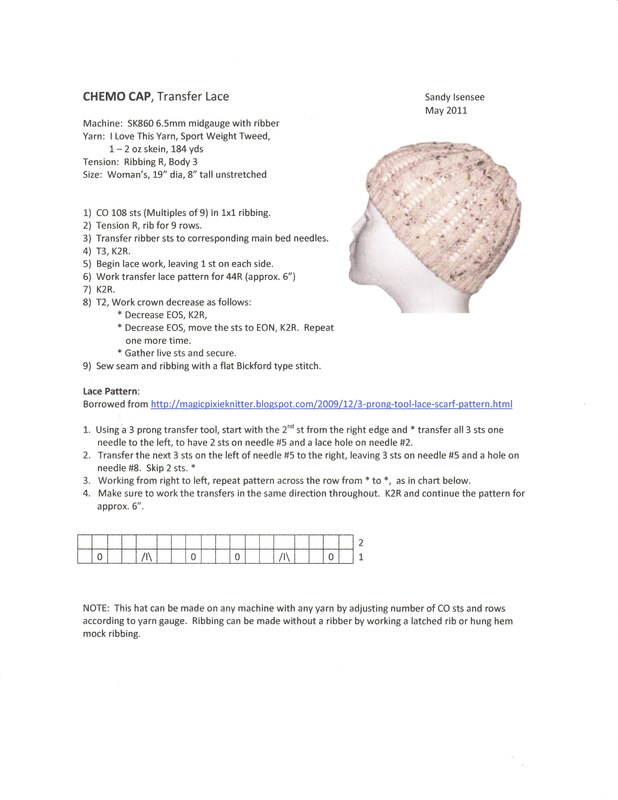 This pattern is labelled Chemo cap, but all of these written as chemo caps work wonderfully just for regular caps too, so don't be afraid to try them. And, they take little yarn and little time, so it is a great way to try patterns out. If you make some and don't know what to do with them, the nearest cancer center will be thrilled to get even one. From experience, I saw tiny little babies to senior people from all walks of life sitting in the chemo chairs or lying in the beds. So, if they don't fit one, they fit someone else, and are very much appreciated!!!! My sister was able to try the cap on and give me some feedback. So I’ve adjusted my pattern and here’s what I came up with. She really likes it and said that it’d be good for spring, fall and cooler summer days and evenings. Soft yarn is a must, of course. She also said that she wants the kerchiefs a bit on the long side, because she’s been tucking the point under the ribbing at the back of her neck. She said it works really good to keep the sun off her head. Now, I never thought of doing that. She said the kerchiefs are her favorite right now. And for winter wear, she likes the English rib ones that I made for her best of all. They are soft and non-binding around her head.